Here are a few clips to give you a better idea of what your Hidden Alaska adventure might look and feel like. Special thanks to Chris Haiss (R.) for her photography support. 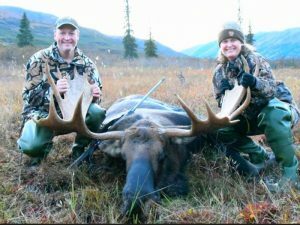 The above clip is a full episode of Outfitter Rating TV reviewing our moose area. The above clip is of Steve Klinkhammer after he took his ram in the high country on 14 Aug 2017. Above is a clip shot at our lodge. This clip shows some flight scenery from our lodge back to Anchorage. This clip was compiled by Chris during their fall trip where we saw both rain and blue skies. The rain left the trail a little swampier than normal for a late fall hunt, (and no, the trail to the high country is not all this bad). However, the trail ride did add to the adventure for them–a trip they will always remember and cherish. The above clip shows what our hunting area looks like in April during our spring brown bear hunts.